Something that Brazil can do better than Denmark amplifies us great real financial power on the World horizon. 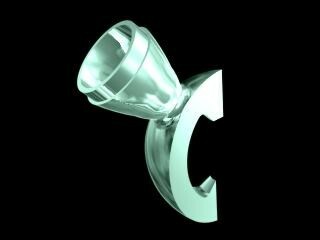 Commercial Products Industrialized or Manufactured and Non-Commercial Products through Manual Molds Available. 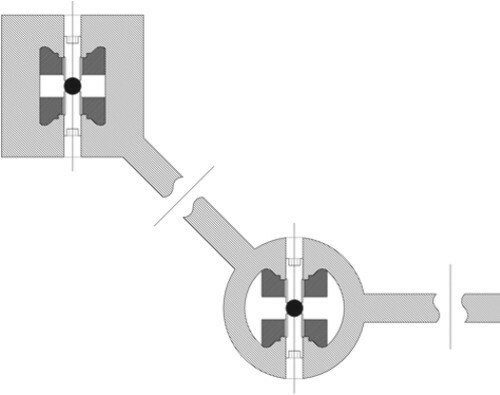 16 pieces for closing diameter of one meter and 32 pieces for closing diameter of two meters..
below on the top pieces with massive aspect and at the bottom pieces with mass relief. 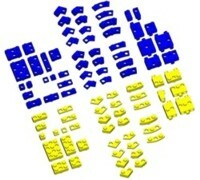 Pieces of 37.5X12.5X12.5mm, 0.5mm of Wall. Faces of Form in Limit of Tangent / total radius relief and functional radius relief / TENSION RELIEF. the simplicity of the stacking of these pieces, for Elevation of Levels. Block hollow With box for hitch of 1/2"Ø flexible tube and Tether screwed in Conical Gloves in the center. PREVENTS BREAK OF WALLS FOR HYDRAULIC AND ELECTRICAL PIPE EXCHANGE. 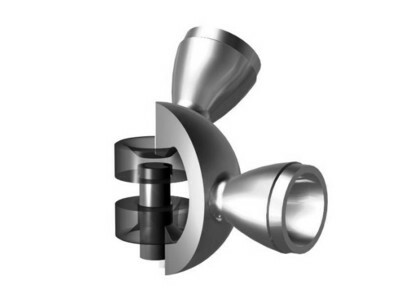 Or larger diameters in vertical branching niche with access for easy tube exchange and maintenance. for the realization of Modulated Beams (aluminum prototype in the 1/5 scale). 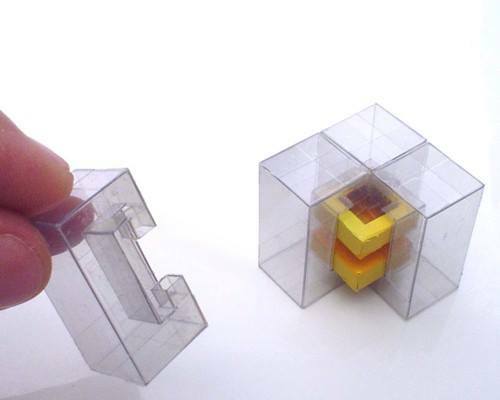 The new geometric shape of the blocks was designed for application in Real Constructions, the pieces are interweaving together in the horizontal direction and fit the whole height of the pieces, one piece is literally inside the other piece; because it adds half of the docking height up and half the docking height down. This New Construction System offers high strength and performance for Architecture and Engineering. There are 13 basic types of fill, double-height pieces, which can generate curved walls and complex modulated geometric compositions, the blocks are derived for meter initially (25cm + 12.5cm), with half-height pieces for finishing are mounted on the base in openings and at the apex. Scale 1/1 for Construction, Houses, Buildings, Retaining Walls, Vaults, Stairs, Slabs, etc. Scale 1/5 for Partitions, Furniture, Utilities, Toy .. 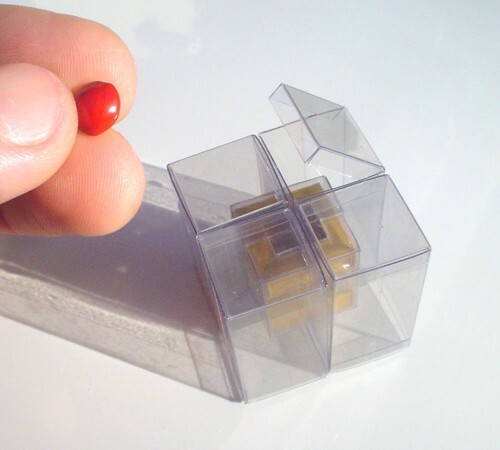 Scale 1/10 for Furniture, Utilities, Model, Toy, size similar to Lego's blocks. Scale 1/20 for Model, Model, Toy, Utilities, great price of the pieces. MEASURES MAY BE ADAPTED TO ANY UNIT OF MEASUREMENT, ACCORDING TO NEED AND DEMAND. + Has the entire height as a cohesion of fit ( high cohesion ). + It is the fastest brick that exists, as fast as possible. It is the toughest brick possible in the assembly set. The Blocks are sewn horizontally in zigzag, 45 ° interlaced, the vertical fit is made at the entire height of the pieces, half down and half up. 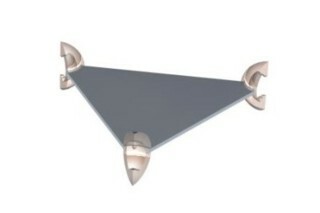 + Assembled plates are solid, they generate super resistant Utilities. 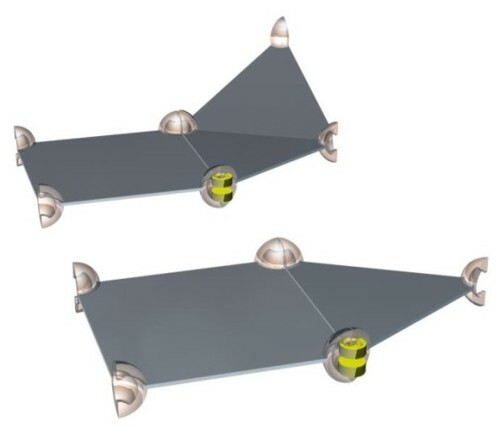 + Unlike Lego (surface and decorative fitting), this Construtive System of docking is for Buildings and Utilities because it has a great Structural Strength of Performance (structural docking). + In Model, Toy, favors Partnerships, offers possibility of Advertising for other items: automobiles, furniture, appliances, doors, windows, roofs, etc, besides reference opening of Common Scales for Architecture, develops activity of practical study of mathematics, geometry, axes, topographic levels, news Constructives Systems, complements (Knowledge in annexed materials). + There are 26 types of pieces, both for massive pieces and for pieces with mass relief (13 pieces of filler, double-height pieces, and 13 pieces of finishing, half-height pieces, for down and for up, providing perfect finishing for the assemblies): 3/3 (mirror parts 'S' and 'N'), 3/3 X2 (form of fish), 2/3, 1/3, corner 'L', corner 'C', 72°: 90° +18° (internal angle of 108° Pentagons), 60°: 90° + 30° (Internal angle of 120° form Hexagons), 45°: 90° + 45° (internal angle of 135° form Octagons), 30°: 90° + 60° (internal angle of 150° Dodecagonos form), diameter of 1 metre (or centimeters in scale) and diameter of 2 meters (or centimeters in scale). Great diversity for the possibilities of free geometrical creations for the start of the Constructive System as a Product for Civil Construction. 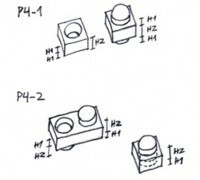 + It is the perfect derivative geometric form which offers the greatest possible resistance to Fitting Blocks. + Blocks are special for retaining walls, they can be supported from top to bottom (central conical gloves with turnbuckles with nut and nut or iron and cement bonding). 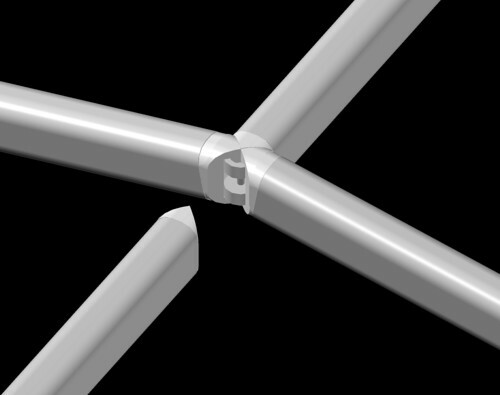 + Greater resistance in balance possible by the use of several interlaced materials; in a assembly grow in diagonally, the high structural rigidity performance of more resistant materials together with soft to ductile fill materials in ideal assemblies can offer ideal Structural Calculation adapted for resistance to Hurricanes and Earthquakes. + Mass relief from Blocks can easily serve for passage of electrical and hydraulic pipes, and further maintenance. Specific blocks of the Construction may have openings for fixing of plugs or taps. + TECHNOLOGY PREVENTS BREAK OF WALLS FOR HYDRAULIC AND ELECTRICAL PIPE EXCHANGE, advisable to use of Flexible Tubes with Quick Hitch for Hydraulic and Electrical Pipe internally the Walls or in vertical branched niche with access for easy tube exchange and maintenance. + The Construction System of the New Blocks is practically a one new Hardware Educational (of America), Moves, directs North and South of the Basic Parts for Constructivity, Mobility, and Unity, Filling Parts Grow Up and Down. My Grandfather said: "If you have nothing to do, Change a pile of place bricks..." able to create a different and more beautiful pile somewhere else, or do exactly the same stack, so were born Properties Mobile such as Option for Mobility, because Time is Will and Space is Movement. Each technology of diverse materials and diverse forms for full height of fit can bring us understanding to new ways of constructing joining diverse types of materials and their better forms adapted to specific functions according to application. The scale model can bring us initial feel of reference for Increased Freedom of Creation with Modulated Constructive Systems for simple and natural solutions for Design through the Model, including modulated complements, fittings between structural materials, transition materials and fill materials. All options will be evaluated according to the advantages of performance, attractiveness, visual, practical, technical and commercial differences. 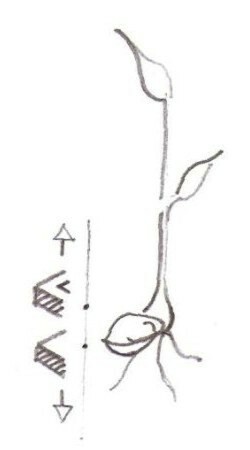 The union between several materials makes the whole height of docking the possibility of light malleability in filler together with the resistance of a more rigid structuring, in assembling suitable materials can be comparable to the behavior of the bones, muscles and filling tissues of the body of a being alive. 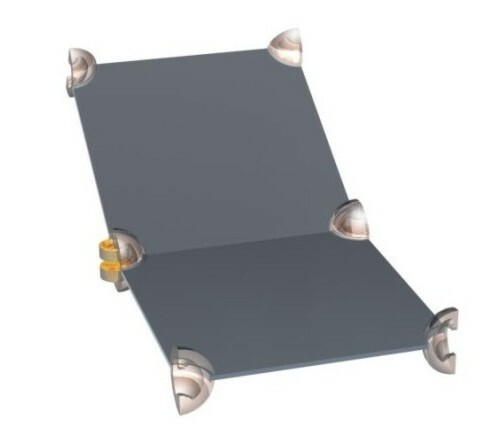 The strengthening of resistance of the pieces by rounding the faces generates tension relief for ductile materials, can be adapted according to Structural Calculation for materials, scales and specific applications. 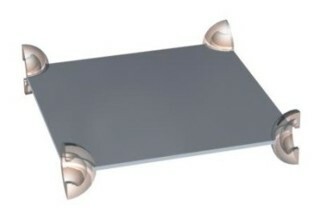 Wide range of application diversity with less thickness, for example can generate much finer partitions for parts of this Constructive System considering solid plates, for scales smaller than 1/1 scale, assembled by systems with several fixation options: for tether turnbuckles, iron and cement bonding, clip or glue. It makes possible the use of blocks with different materials: Ceramics, Plastics, Rubber, Glass, Concrete, Soil-cement, Metals, etc ... We foresee blocks with structural union between them, metallic, or in concrete of high performance with internal reinforcement for pillars and columns for example. Economy of 80% to 90% of the time for construction, assembly time by docking, internal structuring or by special pieces for pillars, only fine smoothing mass in fine seams and painting. Economy of 100% in mortar and cement plaster, does not use mortar or cement plaster. Economy in manpower, do not need to specialized manpower, a child assembles the system. Greater diversity of pieces for realizing Architectural forms more richer and free, generates assemblies in horizontal or in vertical..
High cohesion and strength, solid unit of pieces fully one inside the other in whole height of docking (System Equilibrated which does not generate critics efforts in Structural Calculations, without turning, does not generate 'Moment' efforts). Simple adaptation of the Projects to the Construction System, with few pieces in a scale of 1/10, or 1/20, are performed in Floor Plan, which provides greater sharpness dynamics to predict previous solutions for any detail, unlike Project by Computer, or even as an instrument of great Complementary Value, a Floor Plan in a Model, or even a Model of a whole level of pavement, offers a practical vision of the organization and flow of the work of construction. Everything provided in the practice of whole material resemblance before construction begins, includes special blocks for passage of hydraulic and electrical pipe required, offering a simple three-dimensional mounting map, palpable, solid and economical for building facilitation. Cleaning in the work of construction, elimination of leftovers, elimination of breaking of blocks by simplicity of modular adaptation of the measures for shafts of 12.5cm, derivation of meters of blocks in length, width and height. Perfect vertical alignment of the walls according the perfection of the blocks, does not offer a risk of difference which demands expenses for repair of imperfections as it happens traditionally in the works of masonry the excessive expenditure in rework for leveling of walls with high amount of cement plaster. The pieces fixed at the base of the floor perfectly aligned form a Floor Plan, facilitating the simplicity of only docking the fill pieces, pillars and finishing later. In accordance with Structural Calculation, every few meters in line are realized pillars with internal rebar to the cast bricks for greater stiffness of walls, walls, structural floors or vaults, or as the case the design of cables tether screwed from the top to the foundation through special blocks, blocks with higher strength fixed on each other can serve as pillars. Structural Solutions adapted according to Structural Calculations, always providing Technical Team for Dimensioning of Resistances in advice of use and assembly according to materials and scales, and Technical Team for Structural Calculation and Realization in Construction Scale. It avoids breakage of walls to change pipes which we envisage to be all flexible for simple replacement in Blocks with opening for branching of electrical and hydraulic pipes. It is a Construction System with great advantage for its innovation, since it has minimal involvement of manpower to build compared to any other option, just mount, there is nothing similar in comparative term, the economy can increase according to different Materials and Production Systems. GENERATES GRID CELL PRECISE OF 12.5cm X 12.5cm X 12.5cm, LIKE CUBULAR PIXELS, BUT WITH INTERWEAVING OF ENTIRE HEIGHT IN DIAGONAL INTERCALED OF 45°, FOR CONSIDERATION OF PURE FORMS OF THE BLOCKS IN THE POSSIBILITY OF UNION WITH TRANSPARENT OR TRANSLUCENT MATERIALS WITH DIFFUSION. Leonardo Jorge is an Architect and Urbanist, born in Rio Grande do Sul, Brazil. The Constructive System of Blocks emerged in June 2001, in a more faceted and straight form, the first idea was the realization of modulated preformed beams, for derivation on the wall the pieces would fit together like one shell, parts on the outside and parts inside against each other, later Of the first fast prototype in styrofoam gave the utility of vertical stacking, the pieces had a level of upward docking. 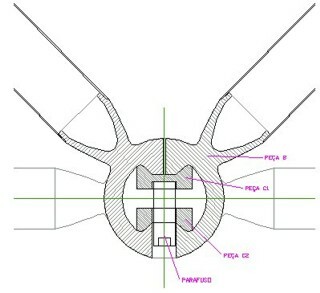 The current Patent is from January 2013, Third Patent, the Constructive System then had its resistance increased considerably as a docking line was added, it fitted up and down, while in the first and second Patents it was only in one direction; This improvement made it possible for the blocks to not generate 'momentum' stresses on the joint faces, since the forces are divided into two points, generating greater individual stiffness of the block and also the assembled assembly, the roundness of the faces also improved the individual performance of the blocks, the new Form of the Constructive System became more efficient and beautiful. The creation was based on the adaptation of resistence of an Ideal Beam. The Project was registered in the CAU as a Registry of Copyright Law (RDA) in October 2016 (Definitive Approval in October 2017), applied to Products for Civil Construction, encompasses improvements and new forms of the Building Blocks and Tissue Arrow System (Complementary Construction System described below), considering Application for Urban Influence for Transformation of Degraded Areas, making the scale a Material Tool as an Instrument of Communication and Knowledge Vehicle for Opportunities of Focal Solutions directed to each specific case, the Author will make available the Forms for use pondering solutions from the use of Molds to carry out pieces for Models (toy), and to Molds for the realization of pieces in the scale of Construction, with opening for new ideas and constructive solutions, including knowledge for new Opportunities by the Manufacturing (simple molds, utilities, quality, raw materials, beauty structural details for Architecture: Matter Transformation). The Architect seeks to realize the application in Model, Toy, so as to bring the possibility of creative execution with freedom for solutions in model for Construction, but also has a great interest in developing a higher and complete Educational aspect which provides annexed books of various subjects. Leonardo Jorge does not have Hurry, many cite the Hurry as Enemy of Perfection, this is confirmed in reality when Perfection depends on the direct or indirect Responsibility of other individuals. As Architect and Urban Planner, he feels more secure with the CAU, Brazil's Architecture and Urbanism Council, to which protection refers to RRT and RDA, valid Worldwide Land Registry with reference to Technology and Innovation in Architecture and Urbanism, Than through the INPI, Property of the Industries which literally, and purposely, deprotects, all the Inventors in the World (The National Institute of Property of the Industry, never favor and never Will truly favor Inventors and Creations for the Benefit of Wealth for Countries of Origin and Authors). Let's look at the similarity of Copyright: Who should register and protect through Copyright ? Copyright is the law applicable to any creation of the spirit, in literary, artistic, works, designs and conceptual creations (anyone can register, the value of fees is lower, in each country there is an Official representation, in Brazil it is the site: www.copyright.com.br ). The Records for International Validity beyond the wide Protection for the Maximum Variants of the Forms, has Jurisprudence for Registering Patents of Invention when necessary start of payment of high and constant International Rates, in Brazil Leonardo Jorge still It keeps a Patent of the Blocks. INPI and Similar Governmental Institutions in the World: Registers Ideas, Leonardo Jorge also has the Register of Forms, the Drawing, the Design (the form as the idea is exteriorized), for Products Applied to Civil Construction; including Mockups (Models, Toys), Furniture, Utilities, Several Structures, and Pieces of Chocolate. Always constructive Energy originating from the Americas. Open Project for beginning and continuity of Products to choose focus and promotional applications. In this case, the "idea", scope of protection through Government Organisms such as the Brazilian INPI, becomes irrelevant if the "Form with the idea is externalized" is protected by the Copyright Law for breadth of continuity of the Architecture and Urbanism Project. After Protocol of Forms in the CAU, as the Project is not a Machine, the new variants and improvements of the Project in Evolution of Forms are still subject to Protection by the INPI, but only by the Author (Protocol of Forms), if it is necessary or possible in time the payment of amounts in the order of US$ 700,000.00 constantly from the second year of Protocol, considering international fees for Attorney in each Country of Registration, Sworn Translation and constant differentiated values, to know more about the operation of the International Deprotection of "Ideas" By the Global Governing Bodies access the link: RICHES FOR COUNTRY X INPI, (Constitution X Treaty PCT) / Text in Portuguese / In Respect Pricipally: THE INTERNATIONAL LAWS RELATING TO COPYRIGHT. Is there any reason why this is different for anyone, anywhere ? Among other thousand this Creation is Brazilian, is from Brazil. Because it is a Construction System, much better than Lego, more assembly options and high performance of cohesion in the fittings, we foresee a great success. We are developing several prototypes in different materials, Leonardo Jorge still seeks a Partnership to produce a Commercial Product of this Construction System applied to Architecture and Engineering. For construction, the block can be a whole cast for the passage of pipes, mass relief and structuring ... it is very simple then to pass electrical and hydraulic pipes having a good price per block and also to structure with iron and mortar the wall inside the blocks as the necessity. The vertical wall mounting blocks can also be laid prestressed from the top to the floor, also floors and slabs by simple or overlapping planes. The Constructive System has Great World Power. Unlike clothing Tissues which has its own filling through its constituent material, Tissue Arrow performs freeforms of structural mesh more open to our eyes, to fill per lids which increase the resistance of the creations and hermetically close the modelings created. WE AWAIT THE AVAILABILITY OF PIECES PRODUCED, PRODUCTS, TO CRIATION OF WEBSITE WITH INSTITUTIONAL IMAGE. Ernest Rutherford formulated the hypothesis that radiativity was not a phenomenon common to all atoms, but only of a certain category. Energy is characterized as a reference of mass, the opposite is destructive ignorance that has no chance of standardizing the complexity of matter to extract standard mass energy pattern. Niels Bohr worked with Ernest Rutherford demonstrating his great respect for him, he also devoted himself to the study of the atomic nucleus. The "drop of water" core model proved to be very favorable for the interpretation of the fission phenomenon of uranium, which opened the way for the use of nuclear energy. Bohr discovered that during the fission of a uranium atom a huge amount of energy was released and he realized that it was a new energy source of very high potentialities. Bohr, for the purpose of harnessing this energy, went to Princeton, Philadelphia, where he met with Einstein and Fermi to discuss the problem with them. Einstein was the first physicist to say that Planck's discovery of quantum would require a rewriting of the laws of physics. To support his point, in 1905 he proposed that light sometimes acts as a particle which he called a quantum of light (see duality of photon and wave-particle). Bohr was one of the most blunt opponents of the idea of photons and did not adopt it openly until 1925. The photon attracted Einstein because he saw it as a physical (though confusing) reality behind the numbers. Bohr did not like this because it made the choice of the mathematical solution arbitrary. He did not like a scientist having to choose between equations. In 1913 he brought the Bohr model of the hydrogen atom, which made use of the quantum to explain the atomic spectrum. Einstein was skeptical at first, but quickly changed his mind and admitted his change of mentality. The appreciation "general apparently" by Einstein's work shows very aesthetic impressions for irreverence, but without deep and practical knowledge with justice for really much more important Physicists. 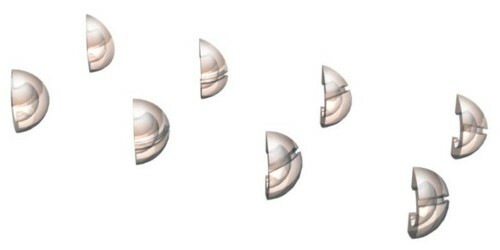 Specie of confused questioning of an imaginative surrealism, Einstein proposed for example "curved space" which confirms in its theoretical place only "refraction, and diffraction, of light" with the electromagnetism connected to the specific atmospheres of each mass with its own cohesion, reference and vectorial balance. Greater real value than the work of Albert Einstein is what proposes Greater World Recognition for the work of Ernest Rutherford and Niels Bohr that raised sharpness, practicality, seriousness and references instead of relative propositions. In the case of ice, it occupies a larger volume than liquid water, because, although the particles (H2O molecules) move less in ice, they acquire a very "spacious" structure making up a density lower than that of liquid water. Ice is an exception because the rule is that a substance in the solid state acquires a very compact structure (more compact than the liquid state, where the freedom of movement of the particles is greater). CRYSTALLINE RETICLES INCREASE THE DENSITY OF WATER IN THE ICE STATE (inflating by crystalline fibers). The ice is water at a temperature below 0 ° C, however, the ice floats in liquid water, that is, although the ice is at the lower temperature, it is less dense than the water, that is, it occupies a larger volume, about of + 8% (that's why if you put a full bottle of water in the freezer, the bottle will burst). Although the water in cold regions is at very low temperatures, the external temperature is well below the water temperature, that is where the function of the ice layer comes in: it functions as a thermal insulation, that is, the fact of that the ice floating allows a protection of the water that is underneath it, and the temperature becomes milder. Situation completely different in other Materials. Can we ask where else such important physical rules do not apply ? algoritmos são desvios menores de interesse, ou interesse de proposição: da razão qual mantém garantias, longe ou perto das atividades e reações práticas, diretas, objetivas e naturais." e se firma para utilidade ativa..
mas adiante: coragem de nem pensar em receber de volta, saber que um bom investimento foi feito. PARA SOBRAR.